To collect your work through Completed Work, log in to Helium Network, click on Work in the left hand navigation menu, and then click on Completed Work. Create a filter to sort out the articles. You can do this by clicking Create Tab in the top right corner. You can create up to five tabs and edit them as need be. 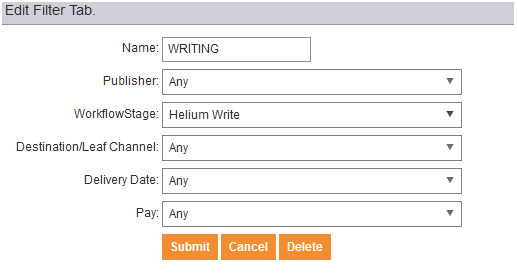 Select the Helium Write stage to display the articles you have written. This will appear as a tab in your Completed Work. Find the article you’d like to copy. Click on the topic of the article you’d like to copy. Highlight the text you’d like to copy. If you would like to copy the headlines, keywords and abstract as well, it would be best to copy these separately. Once the text you’d like to copy it highlighted, press the Ctrl key, and while keeping it pressed, and press the C key. Next, open a blank document such as Microsoft Word or Notepad, press Ctrl and then V to paste the text into the word processor. Make sure you save the document somewhere where you can find it easily. Repeat this process with all of your articles that you’d like to save. I would like to get my new articles published onto Helium. As of 5/21/14, we are no longer accepting new articles.